Coat a 9x13-inch glass baking dish with cooking spray. 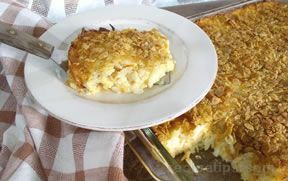 In a bowl, combine the hash browns, soup, sour cream, cheese, milk, and 1/4 cup of the melted butter. Mix well. Combine the crushed corn flakes with the remaining 1/2 cup of melted butter; then spread this mixture on top of the potato mixture. 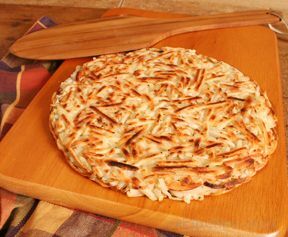 Bake at 350ºF for about 1 hour (or as much as 1 1/2 hours if potatoes are still not done after an hour).